Baffin Island (Inuit name, Qikiqtaaluk), French: Île de Baffin) in the territory of Nunavut is the largest member of the Canadian Arctic Archipelago. It is the largest island in Canada and the fifth largest island in the world, with an area of 507,451 km² (195,928 sq mi). It is named after British explorer William Baffin, though its "discovery" is credited to Martin Frobisher who landed in what was to become Frobisher Bay in 1576 while searching for the Northwest Passage. Many believe that Baffin Island is the "Helluland" of Viking legend. The physical geography of the Island is stunning. Indented by numerous fjords, a glacier-laden mountainous backbone with peaks up to 7,045 feet runs down most of its 950-mile length. It is a land of deep valleys, spectacular fjords, rolling tundra, and jagged mountain peaks. Its population of approximately 11,000, three-quarters of which is Inuit, reside in small coastal settlements. Due to the lack of industrialization the Arctic air is among the clearest on Earth. Though vegetation is extremely sparse, animal life consists of the powerful; barren-ground caribou, polar bear, arctic fox, arctic hare, lemming, and arctic wolf. The surrounding waters provide haven for the Harp Seal, walrus, beluga whale, narwhal, and bowhead whale. It is believed that people of the Dorset culture arrived on Canada's Cumberland Peninsula around 1500 B.C.E.. Though the name comes from excavations made at Cape Dorset on Baffin Island, it is not clear where this culture originated, though several theories exist. These include: that it originated in Alaska or another part of the western Arctic; that it was either derived from, or was strongly influenced by, certain Archaic or Woodland cultures farther south; or that it was a fundamentally Eskimo (Inuit) culture which had developed from a culture called Pre-Dorset. The Dorset people were replaced by the Thule People, a paleo-Eskimo culture and a predecessor of modern Inuit Greenlanders as early as the eighth century C.E.. It is generally accepted that the "Helluland" of Viking legend could be Baffin Island, and that the Vikings visited here in the tenth and eleventh centuries. Its modern name comes from British explorer William Baffin (1584-1622), an early seeker of the fabled Northwest Passage. However, the "discovery" of Baffin Island is credited to Martin Frobisher (1539-1594) who landed in Frobisher Bay in 1576 while searching for the Northwest Passage. The first permanent non-native settlements were established in the 1850s as part of the North Atlantic whaling industry. These prospered until the early 1900s, and was eventually replaced by the Hudson's Bay Company who opened a trading outpost. The first mission stations were set up by Anglicans on Cumberland Sound. The settlement of Iqaluit was home to an American Air Force base from 1949 to 1963, providing a great boom to the local economy. Baffin Island lies between Greenland and the Canadian mainland. It is separated from Greenland on the north and east by Baffin Bay and Davis Strait. The Hudson Strait separates the island from the Labrador-Ungava mainland—of which Quebec and Newfoundland and Labrador are a part - on its south. 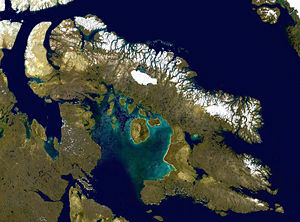 On the west and north, Foxe Basin, the Gulf of Boothia and Lancaster Sound separate Baffin Island from the rest of the archipelago. With an area of 195,928 square miles (507,451 square km), it is the largest island in Canada and the fifth largest in the world. 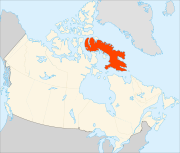 It is a part of Nunavut, the largest and newest territory of Canada, which was separated officially from the Northwest Territories on April 1, 1999. The territory's capital, Iqaluit, is located on the southeastern coast of Baffin Island. Until 1987, the town shared the name Frobisher Bay with the bay on which it is located. The two largest lakes on the island are in the central south of the island Nettilling Lake (5066 km², 1,956 sq mi) and further south Amadjuak Lake. The northwestern tip of the island contain the world's northernmost mines, producing silver, lead, and zinc. Iron-ore deposits have also been found in the island's north. Most of Baffin Island lies above the Arctic Circle and all the communities from Pangnirtung north are subject to Polar night and the midnight sun. For example, the eastern community of Clyde River experiences continuous sunlight from May 14 to July 28, a period of nearly 3 months. In addition the long period from April 26 until May 13 and from July 29 until August 16 when twilight is the darkest part of the day, means the community has less than 4 months of light. In the winter the sun sets on November 22 and does not rise again until January 19 of the following year. However, unlike places such as Alert, twilight occurs for at least 4 hours-a-day. 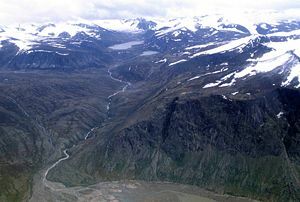 The Baffin Mountains are a mountain range running along the northeastern coast of Baffin Island and Bylot Island, and are part of the Arctic Cordillera. The ice-capped mountains are some of the highest peaks of eastern North America, reaching a height of 1525-2146 meters above sea level. While some mistakenly consider them a separate range due to their island locale, they are closely related to the other mountain ranges that make the much larger Arctic Cordillera mountain range. This rugged, mountainous ecoregion, having a high arctic ecoclimate, is characterized by low species diversity and sparse vegetative cover. The dominant vegetation is an inconsistent cover of mosses, lichens, and cold-hardy vascular plants such as sedge and cottongrass. 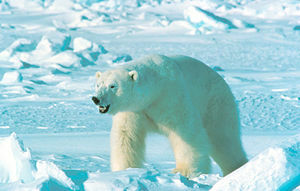 Baffin Island has both year-round and summer visitor wildlife. On land, examples of year-round wildlife are barren-ground caribou, polar bear, arctic fox, arctic hare, lemming, and arctic wolf. Barren-ground caribou herds migrate in a limited range from northern and mid-Baffin island down to the southern part in winter, and migrate back north in the summer, even to the southern Frobisher Bay peninsula, next to Resolution Island. Polar Bears can be found all along the coast, but are most prevalent where the sea ice is located as pack ice, where their major food source —ringed seals (jar seal) and bearded seals —lives. Polar bears mate approximately every year with from one to three cubs being born around March. Female polar bears may travel 10-20 km (6-12 mi) inland to find a large snow bank where they dig a den in which to spend the winter and use for birthing. Arctic fox are found on the fast ice, remaining close to land in their search for seals. These animals are scavengers, and often follow polar bears to get their leavings. On Baffin Island, arctic foxes are sometimes trapped by Inuit, though there is not a robust fur-industry. Arctic hare are found throughout the island. Their fur is pure white in winter and molts to a scruffy dark grey in summer. Arctic hare, along with lemmings, are a primary food source for the island's fox and wolf populations. Lemmings are also found throughout the island, and are a major food source for the fox, wolves and the snowy owl. In the winter, lemmings dig complicated tunnel systems through the snow drifts in order to reach their food supply of dry grasses and lichens. The arctic wolf is also a year-round resident of the island. Unlike the grey and brown wolves in the southern climates, these wolves tend to hunt alone rather than in packs, although a male-female pair may hunt together. The ringed seal is a year-round resident of Baffin Island, where it lives off-shore within 8 km (5 mi) of land. During the winter, it makes a number of breathing holes through ice up to 8 ft thick by visiting each one often, and keeping the hole open and free from ice. In March, when a female is ready to whelp, she will enlarge one of the breathing holes that has snow over it, and create a small "igloo" where they whelp one or two pups. Within three weeks the pups are in the water and swimming. During the summer, ringed seals keep to a narrow territory approximately 3 km (2 mi) along the shoreline. If pack ice moves in, they may venture out 4-10 km (2½-6 mi) and follow the pack ice, dragging themselves up on an ice floe to take advantage of the sun. Summer land visitors to Baffin Island all have wings and all come to the island to nest. Baffin Island is one of the major nesting destinations from the Eastern and Mid-West flyways for many species of migrating birds. Waterfowl include Canada goose, snow goose, and brent goose (brant goose). Shore birds include the phalarope, various waders (commonly called sandpipers), murres including Brünnich's guillemot, and plovers. Three gull species also nest on Baffin Island: glaucous gull, herring gull, and ivory gull. 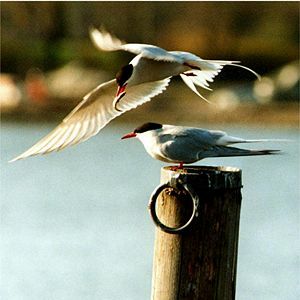 Long-range travellers include the arctic tern, which migrates from Antarctica every spring. The variety of water birds that nest here include coots, loons, mallards, and many other duck species. These include the Harp Seal, walrus, beluga whale, narwhal and bowhead whale. Harp seals (or saddle-backed seals) are marine mammals that migrate from major birthing grounds off the coast of Labrador and from a birthing ground off the south-east coast of Greenland to Baffin Island for the summer. Migrating at speeds of 15–20 km/h (9-12 mph), the pods swim in sync, surfacing for air at the same time, then diving and swimming up to 1–2 km (0.6-1.2 mi) before surfacing again. From their birthing grounds they migrate in large pods, that consist of a hundred or more seals, to within 1–8 km (0.6-5 mi) of the shoreline, which they then follow, feeding on crustaceans and fish. The walrus, a large, semi-aquatic mammal that is the only non-seal pinniped, do not actually migrate far off land in the winter. They merely follow the "fast ice," or ice that is solidly attached to land, and stay ahead of it as the ice hardens further and further out to sea. As winter progresses, they will always remain where there is open water free of ice. When the ice melts, they move in to land and can be found basking on rocks close to shore. One of the largest walrus herds can be found in the Foxe Basin on the western side of Baffin Island. Beluga whale (also know as "white whale"), is a marine mammal rarely found south of latitude 70°N. These whales migrate along the coast of Baffin Island as some head north to the feeding grounds in the Davis Strait between Greenland and Baffin Island, or into the Hudson Strait or any of the bays and estuaries in between. Usually travelling in pods of two or more, they can often be found very close to shore (100 m, 300 ft, or less), where they come up to breathe every 30 seconds or so as they make their way along the coastline eating crustaceans. Narwhals, in the same family as the Beluga, are known for their one straight tusk or two twisted tusks (males only). These marine mammals can also be found along the coast of Baffin Island in the summer. Much like their beluga cousins they may be found in pairs or even in a large pod of ten or more males, females and newborns. They also can be often found close to the shoreline, gracefully pointing their tusks skyward as they come up for air. When they first arrive, the males arrive a few weeks ahead of the females and young. The bowhead whale is the largest summer visitor to Baffin Island. Found throughout the Arctic range, one group of bowhead whales are known to migrate to the Foxe Basin, a bay on the western side of Baffin Island. It is still not known if they just visit for the lush sea bounty or calve in the Foxe Basin. Auyuittuq National Park is a national park located on Baffin Island's Cumberland Peninsula. It features the many terrains of Arctic wilderness, such as fjords, glaciers, and ice fields. In Inuktitut—the language of the Inuit—Auyuittuq means "the land that never melts." Although Auyuittuq was established in 1976 as a national park reserve, it was upgraded to a full national park in 2000. Little vegetation can be found in Auyuittuq Park, although the plants that are found there range from flowers such as Mountain Avens, Campion, Papaver, and Saxifrage to shrubs like Dwarf Birch, Arctic Willow, and heather. Many of the plants in the park grow in clumps to create their own warmer "microclimate" to survive the harsh Arctic conditions. Because of the exceptionally low vegetation supply, wildlife is very scarce. There are only 12 species of mammals that live in Auyuittuq, ranging from Lemmings (both the North American Brown Lemming and the Northern Collared Lemming), Arctic Hare, and Ermine to Polar Bear, Arctic Fox, and some Barren-ground Caribou. 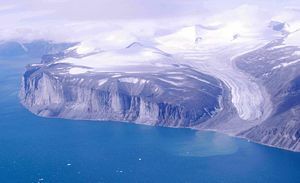 Baffin Island is part of the Qikiqtaaluk Region of Nunavut territory, along with Ellesmere and numerous small islands. It is largely uninhabited, with the exception of a few small coastal settlements. Iqaluit, the largest, had an estimated population in 2007 of 6,184. The total population of the island is estimated at 11,000, all Inuit. Additionally, the communities of Qikiqtarjuaq and Cape Dorset are located on offshore islands. Baffin Island has become popular among the BASE jumping community due to a wide array of 900 to 1,200 m (3,000 to 4,000 ft) tall cliffs scattered around the island. BASE jumping, a sport involving the use of a parachute or the sequenced use of a wingsuit and parachute to jump from fixed objects—with the parachute unopened at the jump. "BASE" is an apronym that stands for the four categories of fixed objects from which one can jump: Building; Antenna; Span and Earth. ↑ 2006 Aboriginal Population Profile for Nunavut communities. Retrieved May 29, 2012. ↑ Encyclopædia Britannica. 2008. Dorset culture. Encyclopædia Britannica Online. Retrieved April 23, 2008. ↑ Encyclopædia Britannica. 2008. Thule culture Encyclopædia Britannica Online. Retrieved April 23, 2008. ↑ The Everything Development Company. Baffin Island Retrieved April 22, 2008. 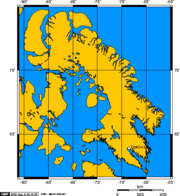 ↑ PlanetWare Inc. Baffin Island Retrieved April 22, 2008. ↑ 6.0 6.1 Margaret Munro, January 10, 2008. Ice formation melting at alarming rate: scientists Metro News Canada. Retrieved April 21, 2008. ↑ Environment Canada. Baffin Mountains Retrieved April 21, 2008. ↑ Fisheries and Oceans Canada. June 6, 2006. Underwater World Retrieved April 21, 2008. Answers.com. Baffin Island Retrieved April 21, 2008. Kuhnlein HV, R Soueida, and O Receveur. 1996. "Dietary Nutrient Profiles of Canadian Baffin Island Inuit Differ by Food Source, Season, and Age." Journal of the American Dietetic Association. 96, no. 2: 155-62. Tarnocai, C. 1998. Monitoring the Integrity of Cultural Sites, Auyuittuq National Park Reserve. Ottawa: Research Branch (ECORC), Agriculture and Agri-Food Canada. Utting, D. J. 2007. Report on ice-flow history, deglacial chronology, and surficial geology, Foxe Peninsula, southwest Baffin Island, Nunavut. [Ottawa]: Geological Survey of Canada. ISBN 9780662463672 Online version of Report Retrieved April 21, 2008. This page was last modified on 6 May 2016, at 20:45.